The Nerf Super Soaker Shotwave is a new model for the 2013 Nerf Super Soaker line. 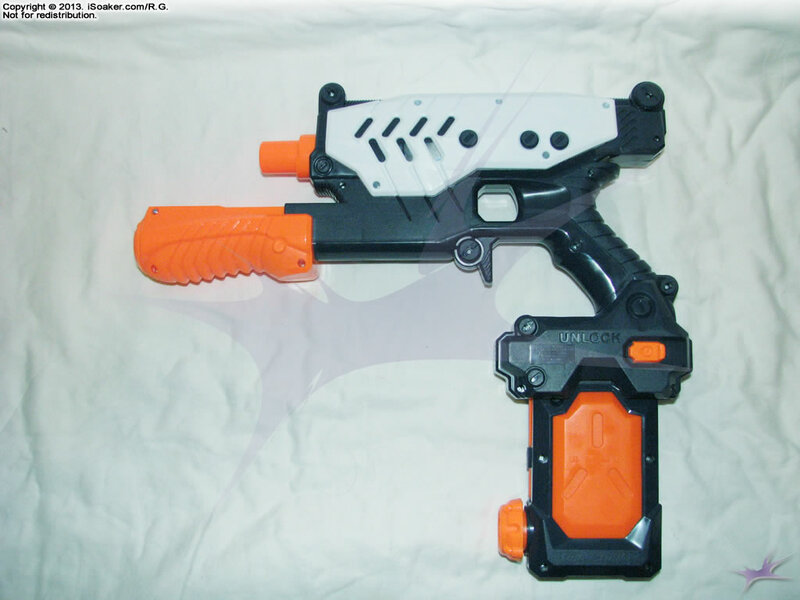 It is a single nozzle, piston-based water blaster that uses the Nerf Super Soaker Clip magazine system as is the smallest of the new pump-action Nerf Super Soaker water blasters for 2013. The Nerf Super Soaker Shotwave features a single nozzle that produces a relatively smooth stream. Compared to the other pump-action water blasters in the 2013 Nerf Super Soaker line, the Nerf Super Soaker Shotwave's stream seems to last a little longer (nearly a full second). However, as with the other pump-action water blasters, the amount of water pushed is completely dependant on pump volume which, unfortunately, is not that large (basically equal amount of water per stroke than the Nerf Super Soaker Scatter Blast). Being pump-action, the range achieved is decent, reaching up to ~10.5m (~35'). Each shot, of course, is rather short in duration and pump lag inhibits one from being able to pull of rapid shots as is explained below. 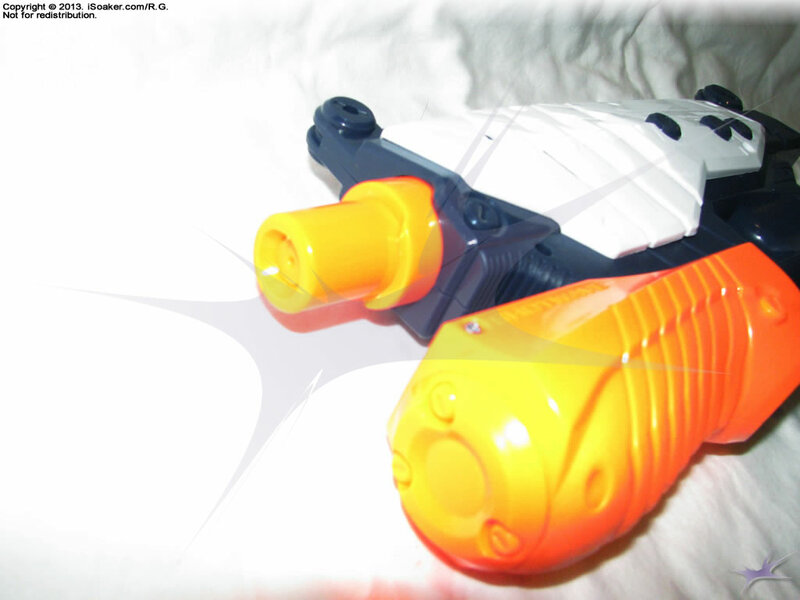 The Nerf Super Soaker Shotwave, like the Nerf Super Soaker Arctic Shock, features a semi-tracked pump. The pump grip area is chunky and feels quite comfortable to hold; its vertical ridges offer good traction when pumping. Pulling the pump to create a stream works well, but the pump intake suffers from some lag, even when drawing water from the reservoir supplied. Unfortunately, like the Nerf Super Soaker Arctic Shock, this makes the blaster stutter if one tries to pump rapidly. It is unclear whether this is a result from tight directional valves or the additional tubing required by the use of the magazine system, or both. On top of this, the amount of water pushed per pump leaves much to be desired; the older Super Soaker Aquashock Sneak Attack pushed out twice the volume of water that this Switch Shot can. These faults with the pumping mechanism likely lie from the long distance between the end of the magazine intake and the pump and seriously detract from this blaster's usefulness in the field. The trigger and grip area on the Nerf Super Soaker Shotwave, like the rest of the blaster, are well moulded and quite comfortable to hold. Again, Hasbro Inc. spent a good amount of time refining their triggers and grips. The grip is also nicely in line with the pump allowing one to put one's full force into the pump. However, the placement of the magazine at the bottom of the grip means that those with larger hands may find the space to be a little cramped. 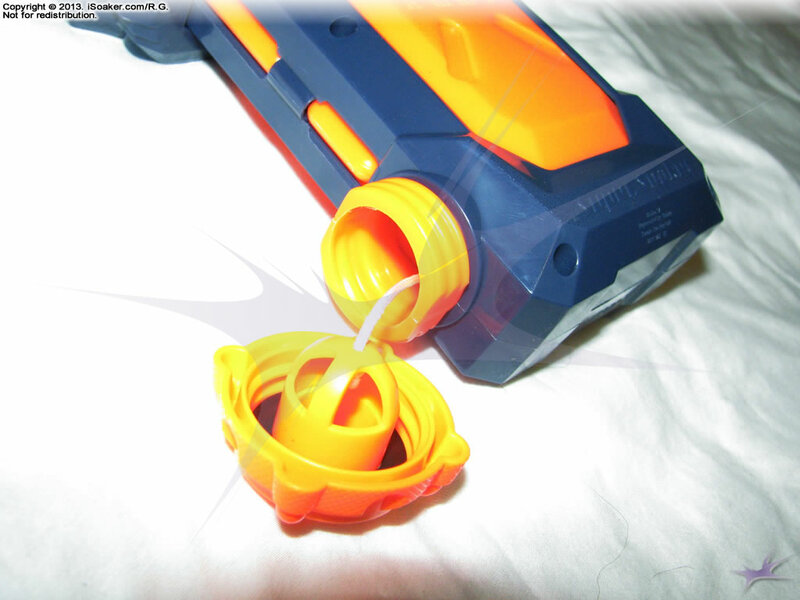 The reservoir on the Nerf Super Soaker Shotwave is identical to the magazine that first appeared in 2011 with the Nerf Super Soaker Thunderstorm and Tornado Strike. Sliding in with a clip and unlocked from the blaster using the "Unlock" mechanism, these magazines can be swapped fairly quickly, but their low capacity leaves more to be desired. One can, of course, swap in the larger magazine from the Nerf Super Soaker Switch Shot, the drum from the Nerf Super Soaker Lightningstorm, or attach the larger Nerf Super Soaker X-Treme Hydro Pack if desired. As a whole, the Nerf Super Soaker Shotwave, like the other 2013 Nerf Super Soakers, is a solidly built blaster with nice styling, but lacking on available power. Its nozzle selector offers some variety in stream patterns produced, but lacks power due to the limit imposed on it due to this blaster's low pump volume. 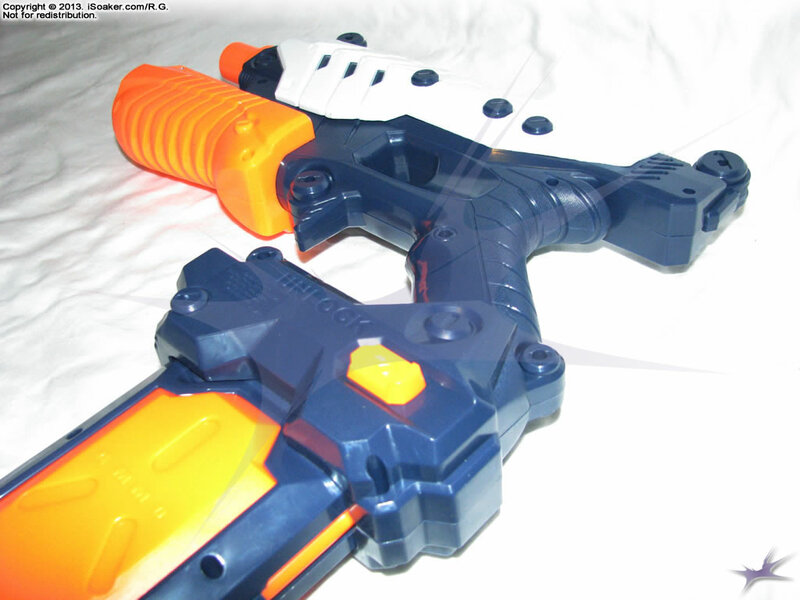 The Nerf Super Soaker Shotwave is best for small skirmishes or as a back-up paired with a larger, pressurized water blaster. Due to the pump's flakiness when attempting to pump more rapidly, the Nerf Super Soaker Shotwave is not really recommended as a primary for any larger engagements. Limited pump volume means limited soaking capabilities. Pump suffers from refilling lag making rapid blasting not possible.